In case you're just waking up to the college basketball season, you've picked a great time to rejoin the madness -- tonight is the annual Marquette-UW-Madison game. The Golden Eagles (6-1) are looking for back-to-back wins against the Badgers (6-1) as they head into finals week on Wisconsin Avenue. MU and UW-Madison have split the last six matchups in the series. Saturday night's game presents an interesting contrast in strengths and styles of play. Marquette leads the BIG EAST in scoring and the Badgers play at a much more deliberate pace. While Marquette relies on its deep backcourt, Bo Ryan has a roster laden with versatile forwards including Marcus Landry (13.3 ppg), John Leuer (10 ppg), Joe Krabbenhoft (7 ppg), and Tim Jarmusz (5 ppg). Most impressively, the Badger big men shoot the ball well, with each of these guys hitting at least 40% of their three-point attempts this season. Throw in point guard and leading scorer Trevon Hughes (14 ppg), and the Badgers have a lethal lineup. For Buzz Williams' crew, Wesley Matthews continues to set the pace. Heading into the final regular season match-up against his father's Alma mater, the younger Matthews is second in the BIG EAST in scoring at 22 ppg, leads the nation in made free throws, hits 88% from the charity stripe, and hauls in better than six rebounds per game. Dominic James has also elevated his play in his senior season delivering a mind-boggling 3.9/1 assist-to-turnover ratio. In fact, since turning the ball over four times in the season opener James has just six turnovers in his last 150 minutes of action -- a remarkable number for a player who handles the ball as much as James is required to do in Marquette's offense. For the year, James is handing out 5.6 assists per game to go along with nearly 12 points per outing. As a side note, today's Journal-Sentinel looks at Dominic James' productivity in the new offense. While Matthews and James are enjoying resurgent season seasons, Lazar Hayward carries perhaps the biggest burden on Saturday night. The Badgers employ an effective rotation of five skilled big men, potentially a key advantage heading into the game. With Dwight Burke's disappointing senior season -- he's accumulated more fouls than either points or rebounds through the first seven games -- and Pat Hazel's inconsistency, the pressure is on Hayward to hold the Badger frontline in-check while Matthews, James and Jerel McNeal work to create mismatches on the perimeter. On UW-Madison's Pomeroy Scouting Report, we can see the strengths of the Badgers. It's everything you are familiar with. Their pace is slow (#332 in the country), they don't turn the ball over (#68), they get to the line a lot (#43), they don't give up a lot of offensive rebounds (#16), and they don't let their opponents shoot a lot of free throws (#26). What is surprising is that UW-Madison's offense (#41) is a lot better than their defense (#127), plus they're shooting a great percentage from three (42.9%), but also giving up a high three-point percentage as well (39.8%). What should we expect when UW-Madison and Marquette match up? As alluded to in the roundtable, the stats prediction is that the teams will be almost evenly matched. According to my predictions, Marquette should end up with a slight advantage on three areas, and obviously lose on free throws. Of course, it's silly to give exact predictions, because there is a confidence interval associated with these areas. Which areas are the most important for a Marquette victory? 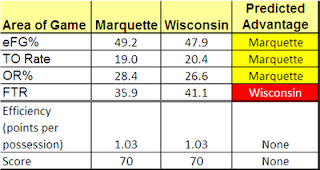 Wisconsin's Turnover Rate - Marquette needs to force UW-Madison into a higher TO% than predicted. UW-Madison's eFG% - UW-Madison makes a high percentage of threes. Marquette is showing signs of being the perimeter defensive team they were last year. 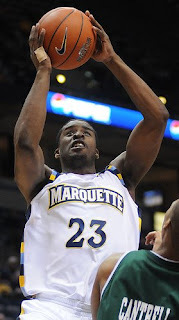 Marquette's OR% - Marquette needs to grab as many offensive rebounds as possible. MU's eFG% - Obviously, the good guys need to make their open looks. MU's TO% - They also need to protect the ball. In summary, according to the numbers, both teams will be worse than their season averages. Therefore, it will come down to whichever team can impose their will. Right now, the numbers are saying it starts on the defensive end. Colin Fly from the AP previews the game. This game is full of great matchups. Marcus Landry is a key for the Badgers. The Journal-Sentinel on MU as the underdog. Sportline digs deep with this preview. Here's the Appleton Post-Crescent preview. Tipoff is scheduled for 8:30pm CT and the game will be broadcast on ESPNU. Steve True and Jim McIlvaine will call the game on AM-540, AM-620. MUScoop will host an in-game chat right here. *Rob Lowe and Tim Blair contributed to this post.